At one point in time I was looking into getting my first calligraphy pen. I took to the web and read reviews posted by many fellow stationary reviewers. After debating for a while, I chose the Pilot Parallel pens. The thing that drew me towards the Parallel line was without a doubt the nib. 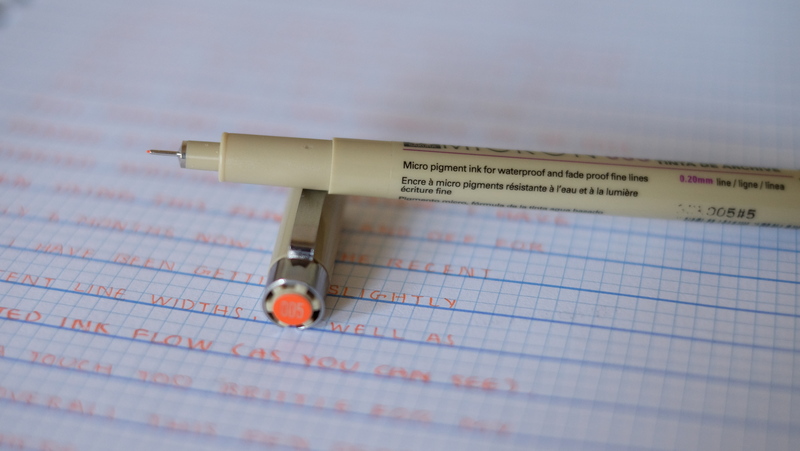 It is very similar to the Automatic pens I’ve seen showcased on websites like JohnNealBooksellers and PaperInkArts. The fact that it could accept a CON-50 converter was another big plus in my book. In my mind, more ink equals more fun. The pen came with very simple packaging that included a plate to clean in between the nib, 2 ink cartridges (red and black), a metal cartridge for flushing the pen (not meant for ink) and an instruction manual. The first thing I observed when I picked the pen up was its weight, or more specifically, the lack thereof. This is a very light pen. Pretty much every part aside from the nib is made from plastic. The weight is more towards the front, allowing for less pressure to form lines. 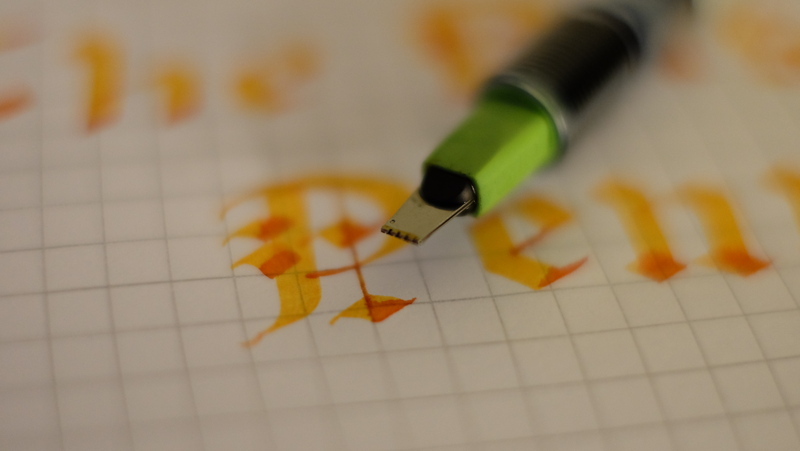 The nib is slightly rigid, but allows a rather generous amount of flex for a broad edge pen. It laid down a consistent line every time I used it. The line variation that came about from the nib flexing was a lot of fun to play around with. 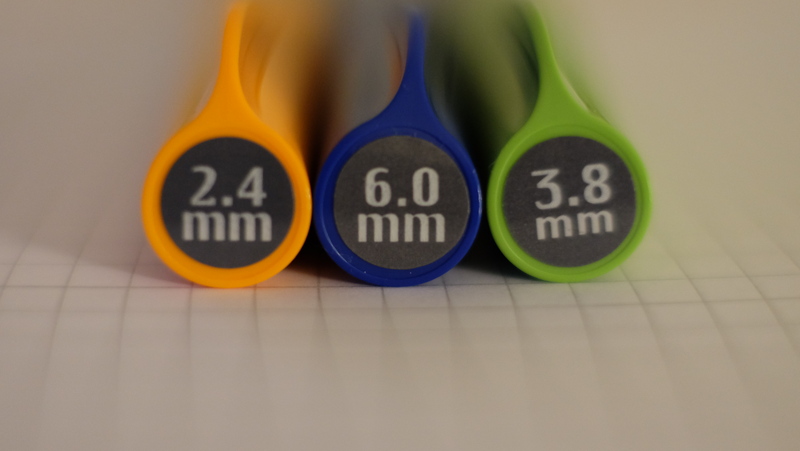 The three sizes I opted for were the 2.4mm, 3.8mm and the 6.0mm. The smallest size the 1.5 didn’t interest me as I already had a Lamy 1.5mm stub nib. The caps are brightly colored, and allow for easy identification even if you lose the stickers. I would recommend these pens to anyone who has either an interest in learning a calligraphic script that requires a broad edge pen, or someone who wants to mess around with huge nibs. At just $12, it is the perfect pen for experimenting with new inks. Bogged down by schoolwork, couldn’t finish the planned review on time, so I dug this one up from my overflowing drafts section for you to enjoy. Expect the Pilot Parallel review tomorrow around 6:00PM PST. As always, write on, my friends. It wasn’t until after writing my first sentence onto a Rhodia DotPad that I realized exactly what the difference between paper and good paper is. When I first saw the price, my eyes bulged like a Looney Tunes character. Hesitation almost immediately set in, and I was deeply contemplating whether I could justify spending that much on a notebook. After much hemming and hawing, I convinced myself that I should at least try it out. 9 pads later, I can safely say that it’s my favorite paper to write on. The smoothness is the first noticeable difference. When the nib glides over the page laying down the ink, it evokes a feeling of liveliness that I find lacking when using other paper. The bright white paper allows the vibrancy of different colored inks to really pop on the page. I initially thought that it was way too bright for my taste, but it seems like it’s something that you get used to as time goes on. 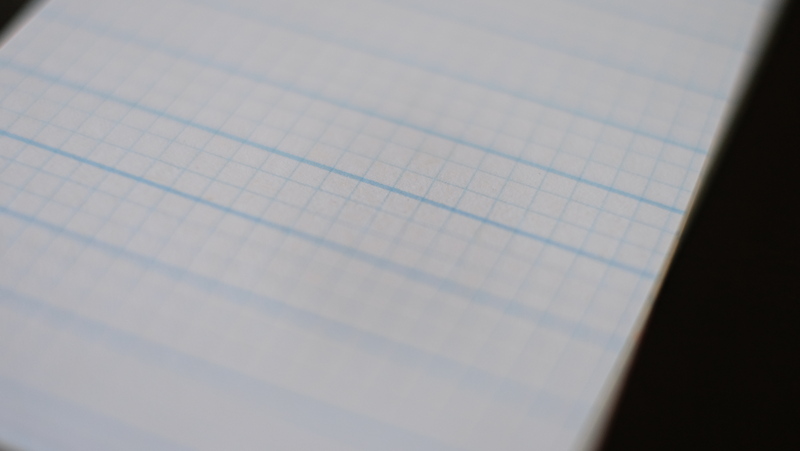 The micro-perforations at the top allow for easy tearing which is convenient feature because I find myself filing notes under their respective topics and dealing with a lot of loose sheets of paper. 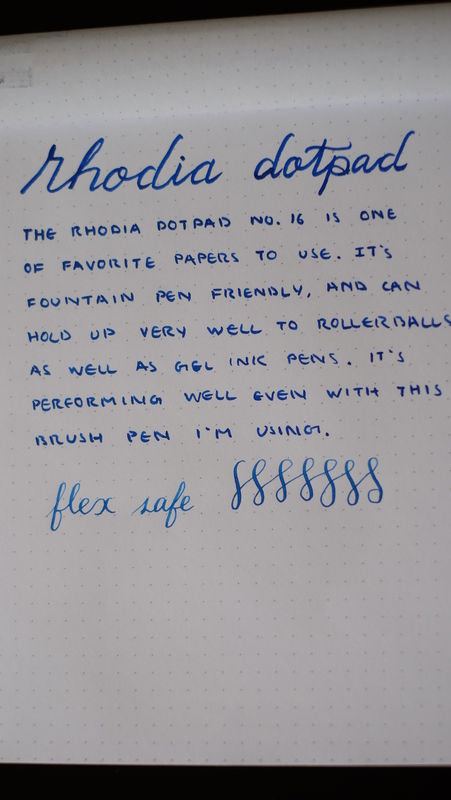 The DotPad was the first Rhodia pad I purchased. 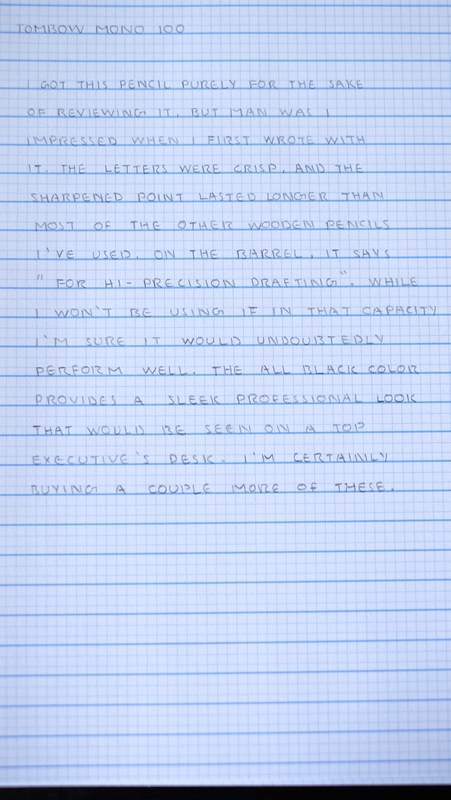 The reason was mainly because I was tired of lined and graph paper (you go through a lot as a high school student). I wanted to see whether I could utilize the “dot-grid” lining to try something different. It took a little bit of warming up, but I started using it for all sorts of tasks. 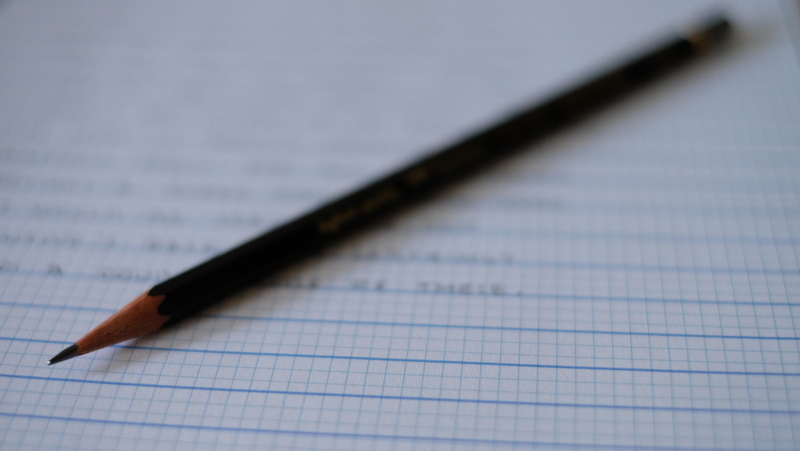 Anything from to-do lists, sketching, crafting lean canvases and writing down product ideas. 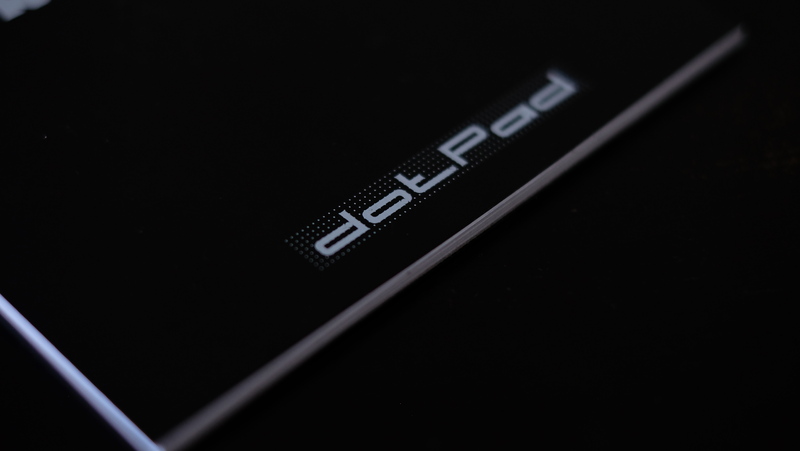 The dots are light gray and are spaced out 5mm. 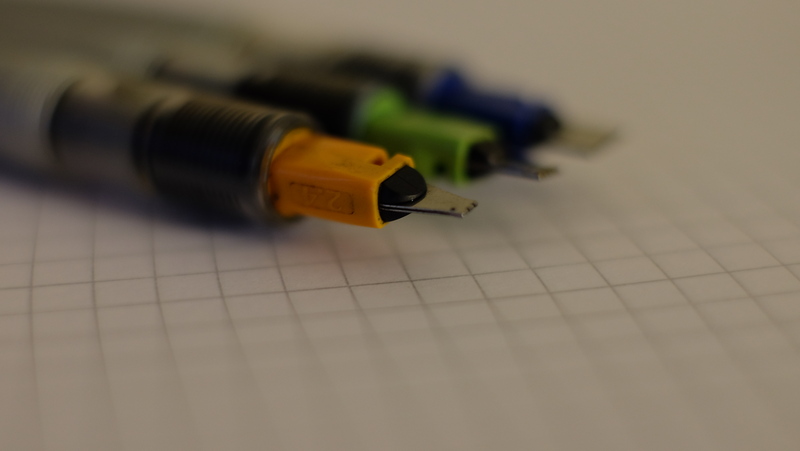 They were unobtrusive, kept my writing straight and also helped easily create graphs and tables. While being a light and relatively thin paper, the Rhodia DotPad manages to cope with a variety of different writing instruments. I tested out roller-balls, gel ink pens, fountain pens and a brush pen. The biggest drawback I experienced was the slightly higher drying time. 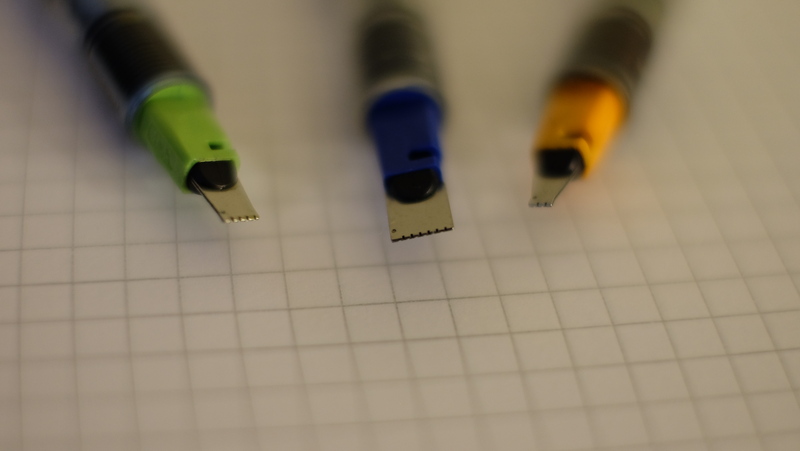 Due to this paper being thin, ink takes a little longer time to properly dry. This might be a bigger deal to lefties, but I feel it’s not too important. 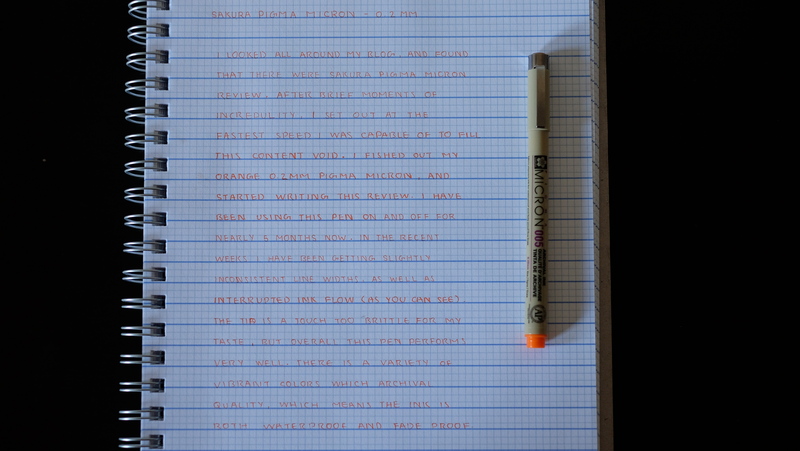 I recommend this paper to absolutely anyone who want to truly experience writing on good paper. 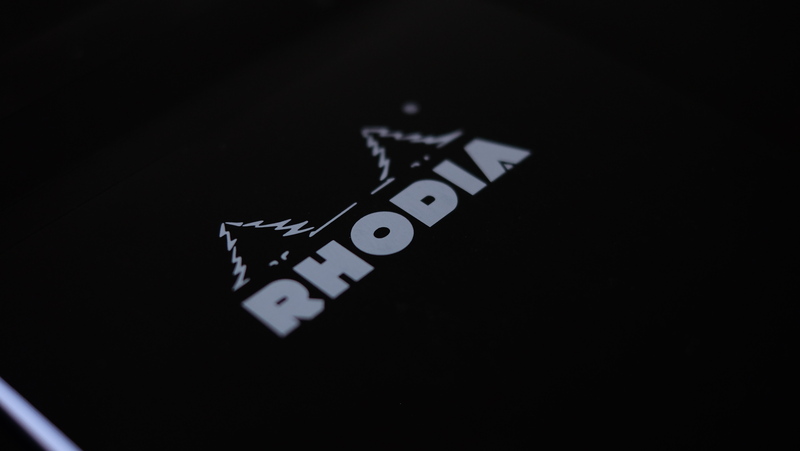 One of the reason for Rhodia’s popularity in the pen community is its unbeatable price for performance. 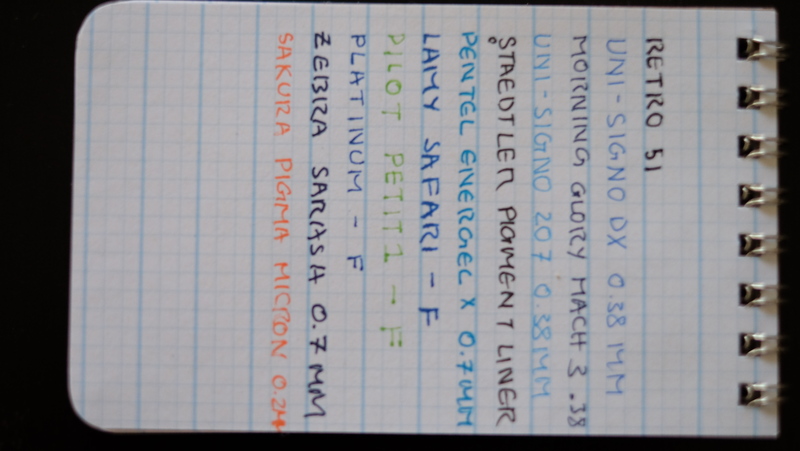 I have yet to find a cheaper paper that can perform at the level of a Rhodia notebook. 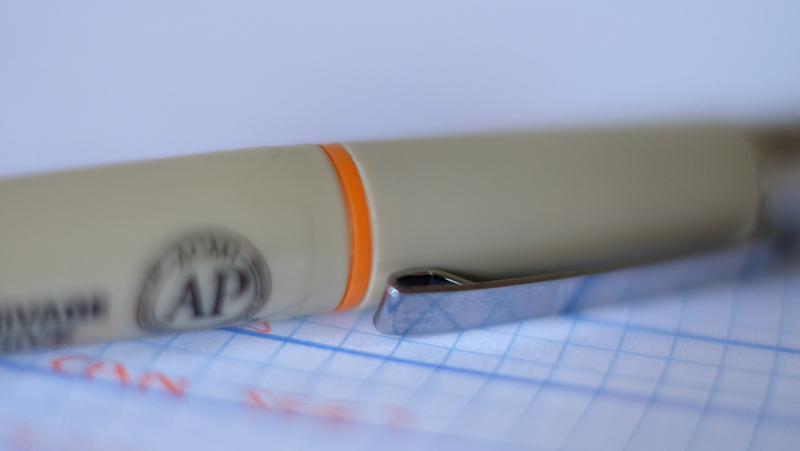 Good paper is also an important aspect of the fountain pen writing experience. 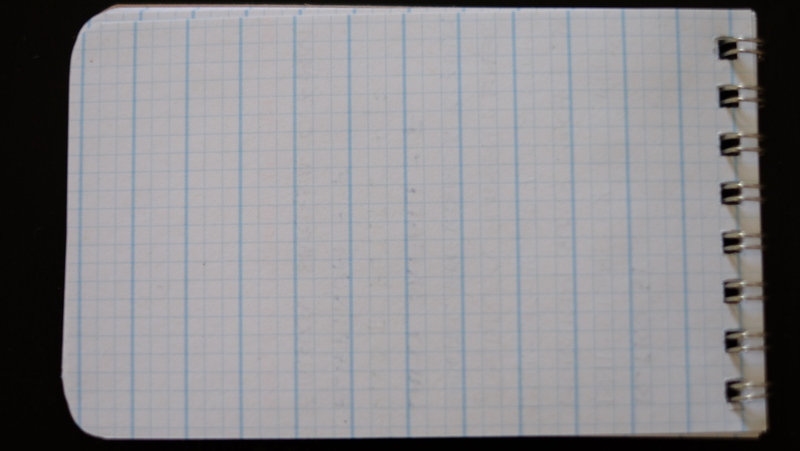 The construction of the Flap Jotter is very simple. Two pieces of recycled chip board covers that sandwich 80 pages of 70lb white recycled paper. This is all held together by the “Wire-O-Bound” binding on the top. 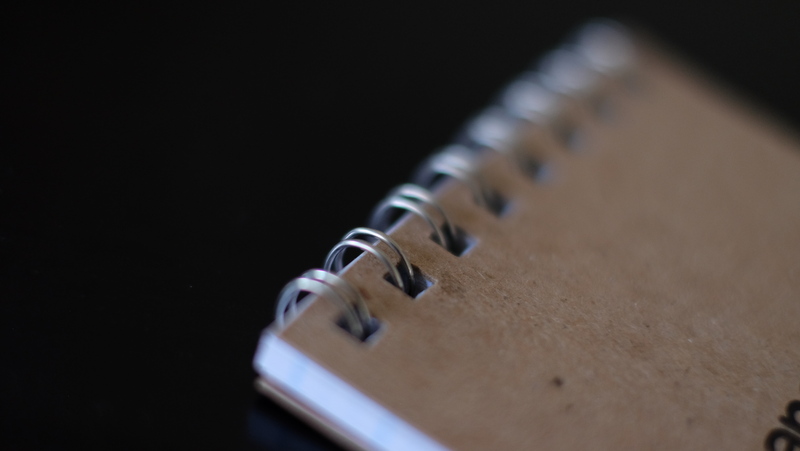 Personally, the Flap Jotter really hits a lot of the points I look for in a notebook. Simplistic design, durable cover, minimal branding and strong binding. Discounting the paper, it’s already proven itself to be an EDC contender of mine. 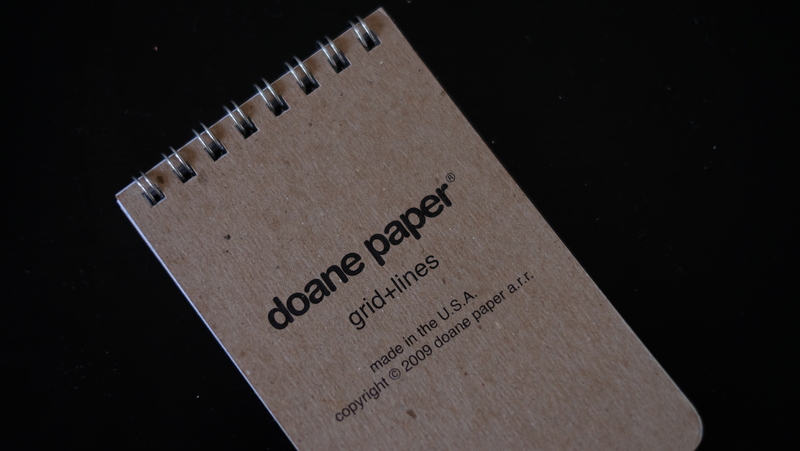 Now the ruling is what initially got me into Doane paper products. I found myself wanting it simply because it would prove helpful when doing my math homework. Having lines to stabilize my rather inconsistent handwriting, as well as graphs that allow me to draw shapes, figures and tables easily, it became an instant favorite. The paper is marketed as white, but the color is actually more of an off-white. While this is not too much of a problem, don’t expect bright white paper. the wide ruled lines lets me write big and not worry about trying to save space. It’s the cells are decently sized and not too big. The one thing that I thought could be improved is the color of the ruling. Occasionally, I found myself distracted due to the bright color of the lines. If they could make them just a bit lighter in color, it would be completely unobtrusive. That would make this already exceptional notebook that much better. 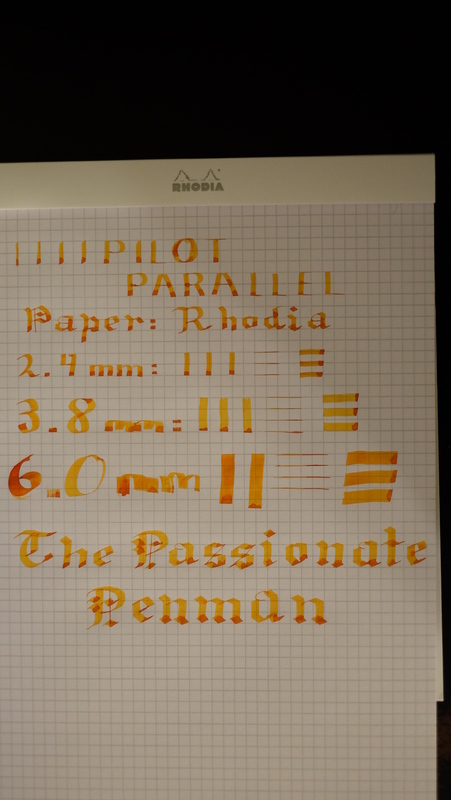 Now the paper is the one thing that surprised me the most with its performance. Generally, recycled papers aren’t known to go well with fountain pen inks. On a typical notebook one can see instances of show-through, bleeding, feathering and a whole assortment of other issues. I didn’t encounter even a single one when I tested the paper. The results can clearly be seen in the picture below. With an almost unnoticeable amount of ghosting, it opens up the possibility to use both sides of the paper, and that’s a huge plus for me. I was going for variety over quantity. Hopefully I achieved this. Barely any ghosting. I’m very impressed with these results. 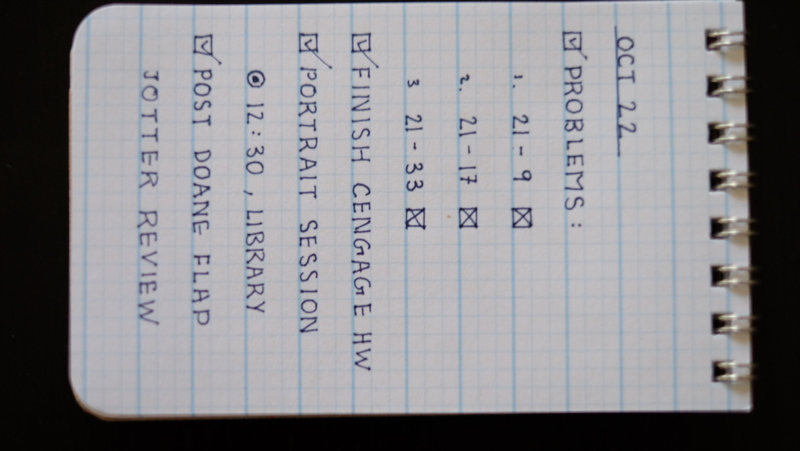 I’m currently using my Flap Jotter to keep track of my daily and long-term tasks. I use it mainly as a both a to-do list and productivity tracker that allows me a look into all the tasks I was given and completed. The ruling makes it easy to draw check-boxes (I love check-boxes). Below is an example of a typical day’s tasks. I recommend Doane notebooks to nearly all my friends as it is one of the best I’ve ever used. I use it for anything from homework and accounting projects, to to-do lists and productivity tracking. The ruling allows a lot of experimentation to find the best use for the individual. I will definitely be picking up more of these in the future. Bet you thought I was gone, didn’t you? Well my friends what can I say. It was the dreadful week known to all college students: midterms week, During this week I had so much tossed onto my already burgeoning workload that I honestly didn’t have any time to post reviews. Adding on to that, it was also a week of religious festivities, and I found myself slowly sinking into the swamp known as procrastination. So I saved all my drafts and will complete them shortly. The first one will come out tomorrow, and the rest over the weekend. On another note, I would like to make a request of my readers. If you notice on the right side of my blog there are links to my Facebook page, Instagram and Twitter. I know that I haven’t been very active on those mediums for a while (especially Instagram), but as the religious festivities end, I decided to fix that. I have been rigorously posting pictures on Instagram of all my pen reviews. I would like to humbly request that you follow me on Instagram. I have found that it provides many uses to document my journey down the stationary rabbit hole. I’m talking just pictures of my day, random calligraphy/quotes, sharing my practice for motivation, sneak peek on what I review next, the possibilities are endless. If I have my readers following me, it gives me that extra push I need to deliver. Please don’t take this as shameless self advertising, but rather an opportunity to motivate someone who’s blog you enjoy reading. Thank you very much, and have a great day! After searching through my blog post by post. 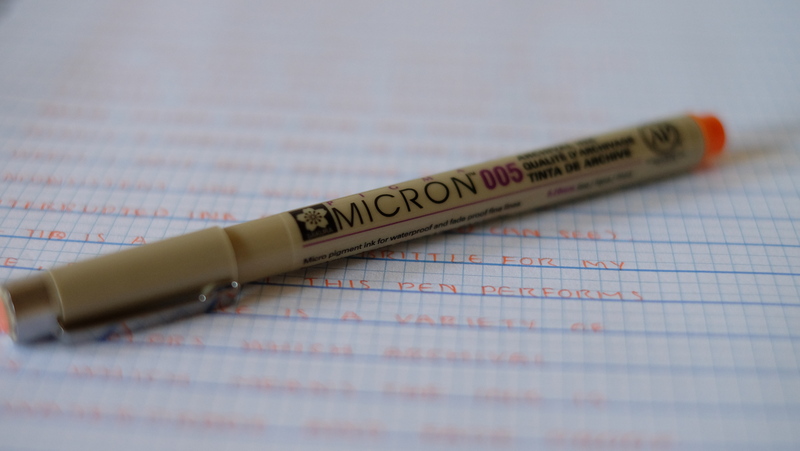 I suddenly realized that I didn’t have a Sakura Pigma Micron review. After brief moments of incredulity as to how this situation came to be, I set out at light speed to fix this lapse of content. The Sakura Pigma Micron can best be described as a marker/felt tip pen. There are many ways that the Pigma Micron is used (coloring, sketching, lettering, etc). It is available in a variety of tip sizes and vibrant ink colors that are all archival quality (waterproof and fade proof). 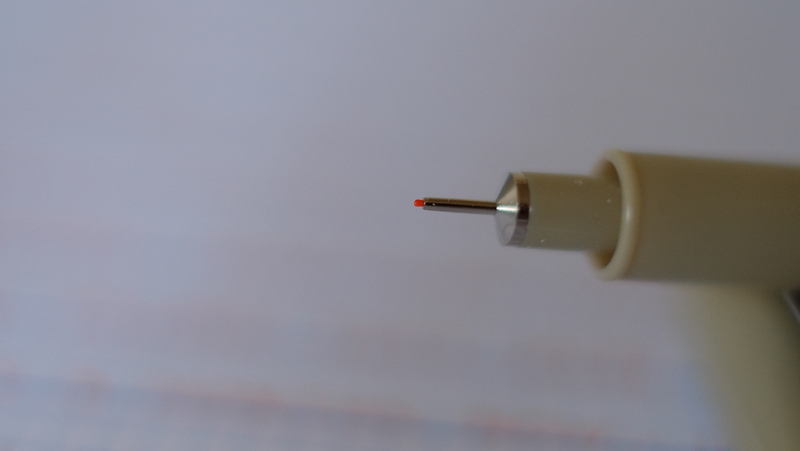 I have been using my 0.2mm orange on and off for almost 5 months now. The body is made of plastic, but don’t let that fool you. While being light, it is by no means fragile. I have dropped this pen both purposely and accidentally on a variety of surfaces. Concrete, marble, tile, asphalt, and wood. Can you see any wear and tear in the picture? That itself is indicative of the durability of the Pigma Micron. Onto the grip section. While not providing any notches/texture of any kind to aid grip, the pen manages to almost never slip out of my hand. I was pleasantly surprised, as this was an aspect of the pen that I was a little concerned about when I was picking it up. However, despite how moist my hands got, it didn’t slip even once. While I did have to readjust a couple of times during extended writing sessions, it was nothing too noticeable. 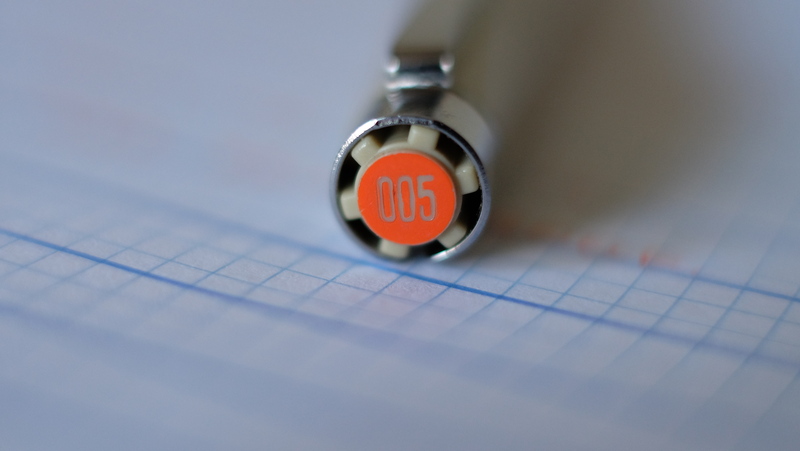 Another positive aspect of this pen is that it can be posted securely. When posting, you hear an audible and satisfying click that signifies that your cap isn’t going anywhere. I have tried many times to dislodge the cap, and it is difficult at best. 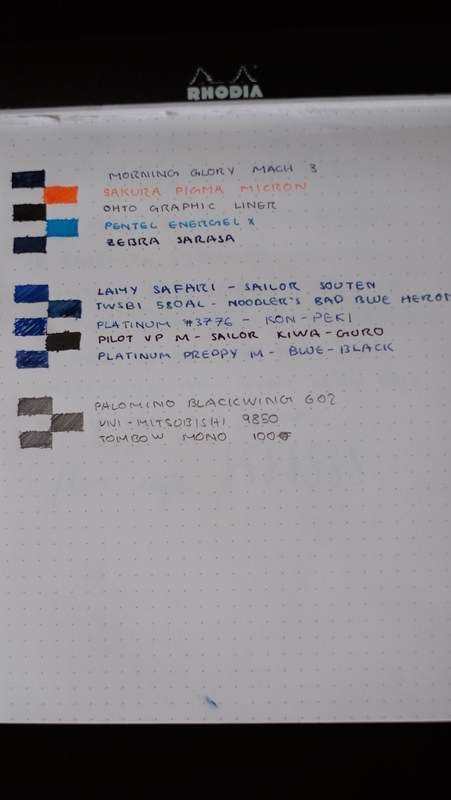 So rest assured, if you’re obsessed about posting your pens (like me), then the Sakura Pigma Micron definitely has you covered. Around 3 months after purchase, I started having a couple of issues. The tip tended to give inconsistent line widths depending on how I held the pen, and by this I don’t mean the writing angle, but just rotation of the tip. I also experienced interrupted ink flow on down strokes that I had to go back and fill in. While it lasted quite long, from the get go, I felt that the tip was a touch too brittle for my taste. I always had to modify my writing pressure to avoid breaking it, so if you have a heavy hand, I wouldn’t recommend this pen. Regardless of pressure, the pen laid down a pretty consistent line when it was still just a couple months old. While deterioration in the writing experience is to be expected as time goes on, I didn’t think that it would be as abrupt as it was. So sorry for the delay my friends, it took me a while to settle down to my new quarter schedule. Now that I’m back and at it, expect a few reviews throughout the month. I got this pencil purely for the sake of reviewing it, but man was I impressed when I first wrote with it. 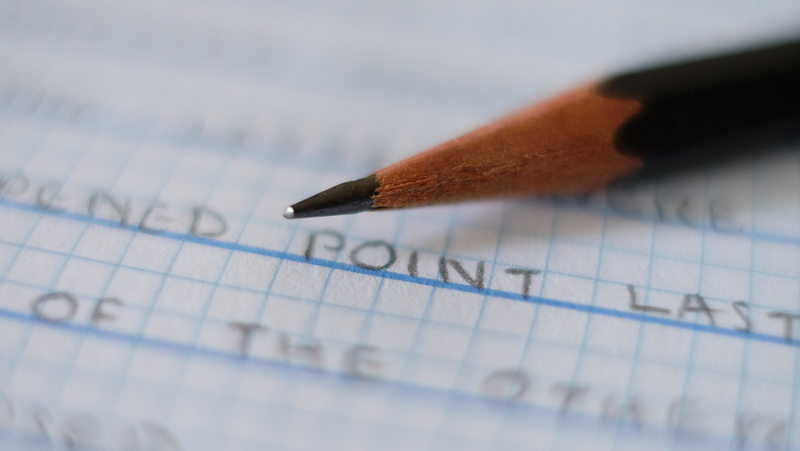 The letters came out nice and crisp, and the point lasted a lot longer than some of the other pencils I’ve reviewed. On the barrel it says “for hi-precision drafting”. While I won’t be using it in that capacity, I’m sure it would undoubtedly perform well. 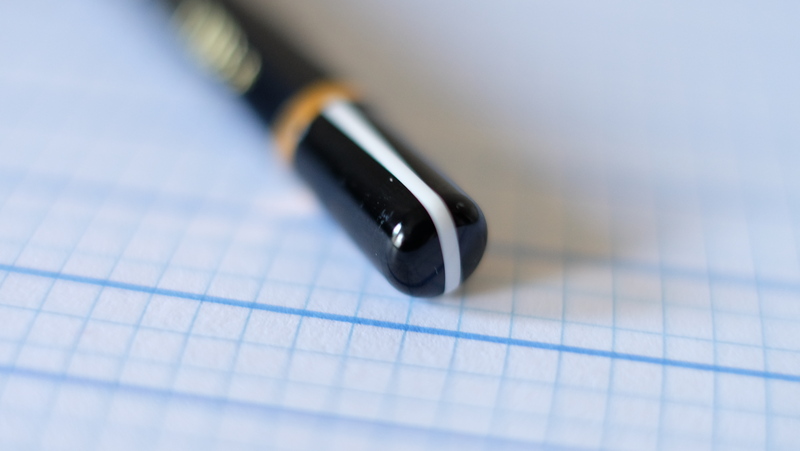 The sleek all black color with that small stripe near the end accentuate the aesthetics of this pencil. It looks like it would be at home on the desk of a high level executive, but at the selling price, it’s an affordable option for anyone who wants a quality wooden pencil that looks good and writes well. I know I’ll certainly be stocking up on a few of these.